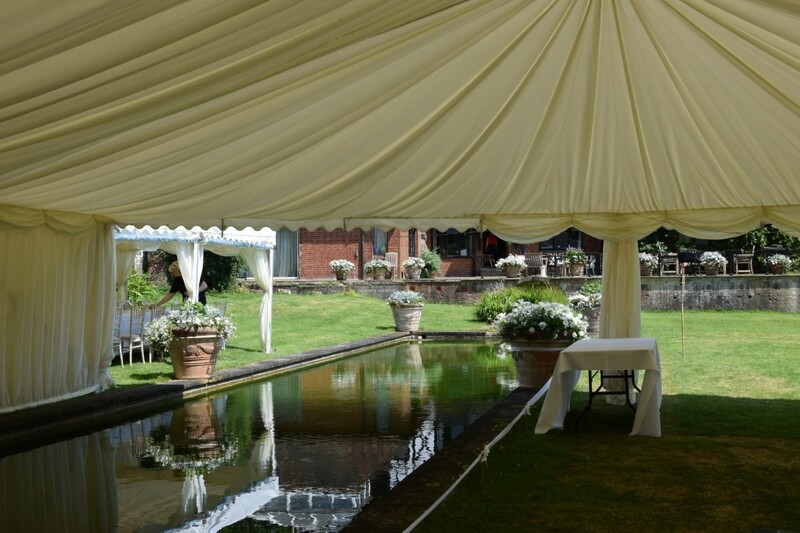 Carron Marquees received an enquiry from an engaged couple who’d found the perfect venue for their wedding and had their hearts set on a marquee reception – but there was a problem. 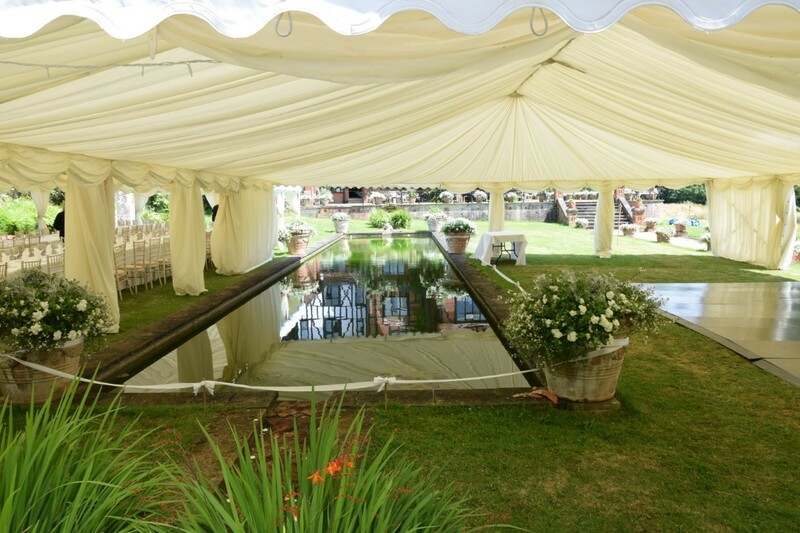 The stunning grounds of Hambledon House in Godalming had a beautiful oblong shaped ornamental pond in the centre which the couple wanted to incorporate into their plans but were concerned that a marquee wouldn’t be possible. 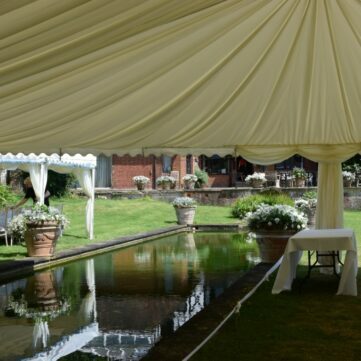 The Italian gardens at Hambledon house are truly beautiful, and the bride was keen to use this as the backdrop for their celebrations but had concerns about the position of the pond that ran through the middle. However, after a chat to the team at Carron Marquees and a discussion about our clear span frame marquees, a plan of action was put in place to realise the happy couples wedding day dreams. 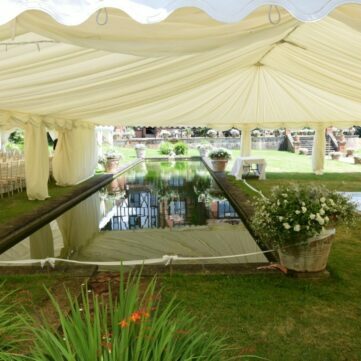 Using a versatile frame marquee meant that not only was including the pond not an issue, but it also made it an integral feature of the reception venue. 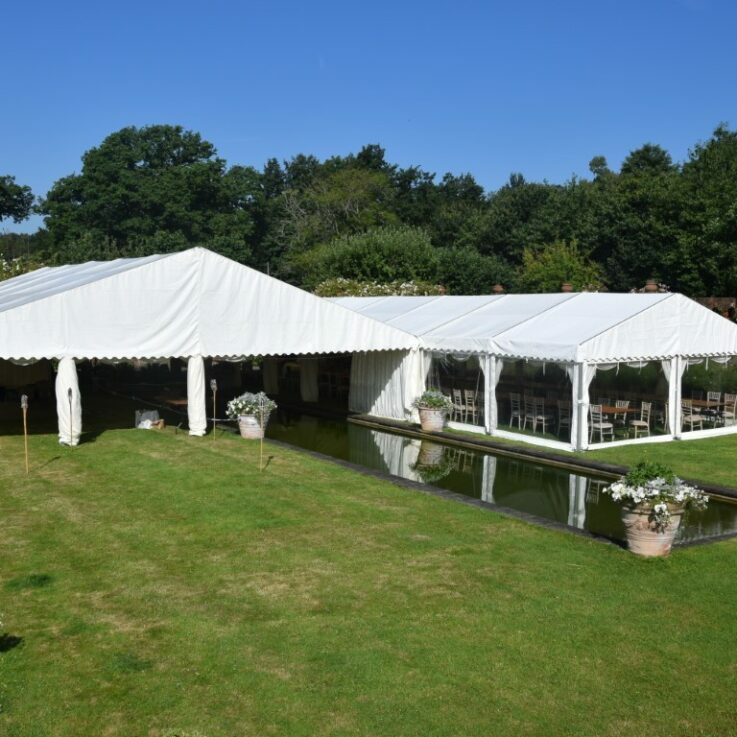 To achieve this, the Carron Marquees team erected a 6m Clear Span marquee on one side of the pond for the dining area to seat 100 guests and help the bride achieve her perfect seating plan of two trestle tables. This also allowed easy access for the catering teams who would be serving guests with their meals and refreshing their drinks throughout the afternoon. 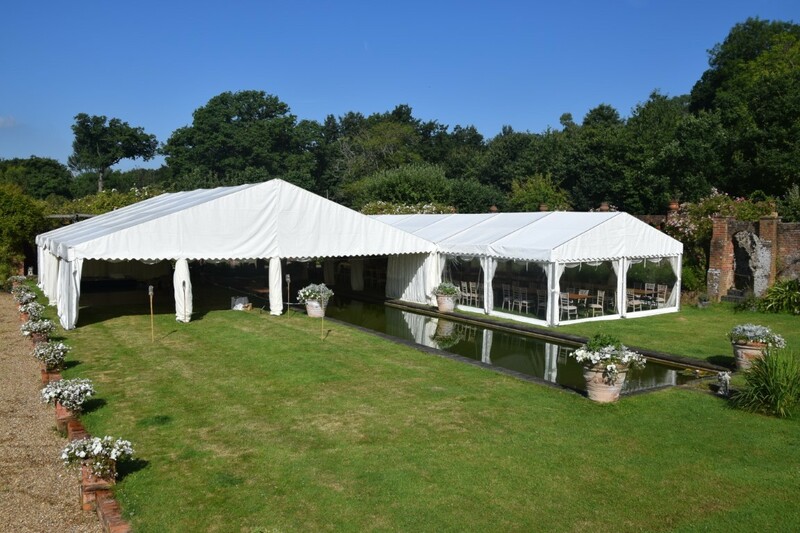 As more space would be required after the wedding breakfast, the couples opted for another 12m x 12m clear span marquee to be erected next to the dining marquee that would include the focal pond as a feature. This space was then decorated and equipped with a full bar area, a stage for a band and dance floor so that guests could dance the night away in this beautiful setting. The feedback Carron Marquees has received from the newlyweds has been fantastic, and the team were happy to have played a part in making their wedding day dreams a reality.